Prototypes of the next generation Mercedes-Benz E-Class Sedan and Estate have once again been captured on camera in Germany. While the red sedan prototype is partially camo-free, the white wagon wears an almost full body disguise as only the roof and side mirror caps are exposed. The upcoming W213 generation will bring the E-Class up to date with Mercedes-Benz's latest design language which means the model will look a lot like its brothers, the smaller C and the bigger S. It's up to you to decide whether this is a good or a bad thing, but we know many have expressed their criticism towards Mercedes-Benz and other premium automakers (such as Audi) for coming with models that look very much alike. Design aside, the new E will have a slightly larger footprint than the outgoing model, but that won't increase the car's weight as the MRA platform sourced from the C-Class will actually enable a healthy weight loss. 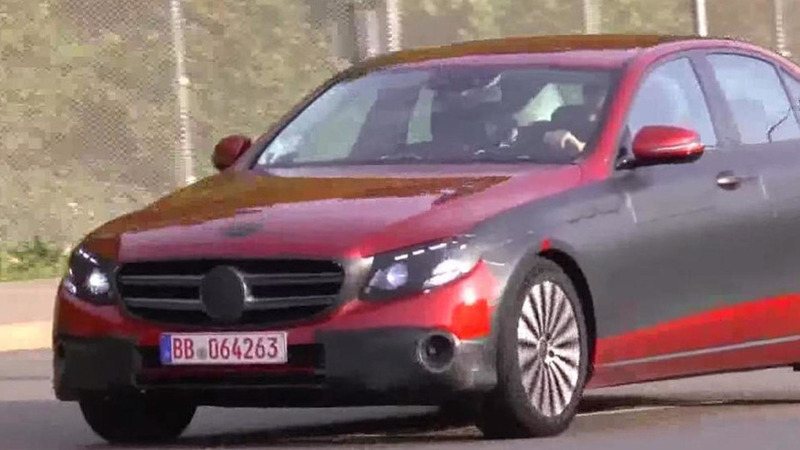 In these two videos we only see the sedan and wagon (T-Modell), but the range will eventually grow to include the usual coupe and cabrio body styles, along with a luxurious Maybach version set to employ a longer wheelbase as seen in a recent batch of spy shots we posted. We don't get to check out the interior cabin in these two videos, but previous spy images have shown the next-gen E-Class will get many bits and pieces from the S-Class, including the dashboard layout. That Maybach version we mentioned will obviously come with a lot more rear legroom and will be sold all over the world, unlike today's non-Maybach E-Class long wheelbase which is only available in China. The W213 sedan will probably be unveiled in January at NAIAS in Detroit and will be followed shortly by the wagon. With the exception of the Maybach model, all the other body styles will eventually spawn fully-fledged AMG versions that will likely use an uprated twin-turbo V8 4.0-liter engine from the C63 and AMG GT.